As we head into the new year, it’s important to take a look back at the past in order to prepare for the future. If your New Year’s resolution for your business is to get more leads and gain exposure, VitalStorm can help you self-reflect and improve. Contact us to discuss how you can increase sales and brand awareness for the new year. Luckily, there are a lot of solutions available… if you’re willing to look. 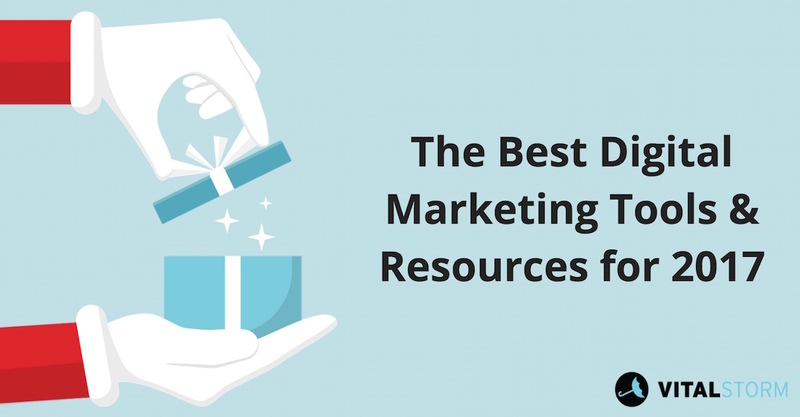 Here are some of the best digital marketing tools and resources to consider for a very successful 2017. We’ve broken the tools and resources into different “departments” for easier reference. Check back often as we will be updating this list throughout the year! If you can swing it, the Adobe Suite (e.g. Photoshop, Illustrator, InDesign, Premiere, and Acrobat) is the industry standard. Use Websta to help you find hashtags. Gifyoutube.com/url – Convert any Youtube video into a GIF by adding “gif” before the youtube URL. Edit Flow – “Edit Flow gives you custom statuses, a calendar, editorial comments, and more, all to make it much easier for your team to collaborate within WordPress. Why might our customers not like us? Have you budgeted enough time and resources for emergencies, complications, and new ideas and experimentation? Do we underestimate our customer’s journey? Add a line of Facebook (pixels) and Google retargeting code. Use landing pages for your PPC and remarketing campaigns. Let other people tell your brand story with truth and authenticity. You can’t do everything. Get used to outsourcing your PPC, social media, email marketing, content curation, and other marketing essentials. Contact VitalStorm for a free quote and walkthrough. Check back frequently as we discover new marketing tools and resources in 2017. Happy New Year from the VitalStorm Family! If you have any questions about copywriting and digital marketing don’t hesitate to contact us for a free walkthrough of our services. Check us out on Facebook, Twitter, and Google+ for more useful digital marketing information.